There are two kinds of magnetic fluxes acting in DC Generator; the first one is because of the stator poles called main flux, while the second one is because of the current flowing in the armature called armature flux. This armature flux weakens and distort the main flux, thus the overall effective flux in DC Generator decrease. 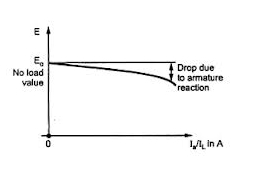 This mutual action of armature flux on the main field flux is known as armature reaction. Overall flux is less than the field flux because saturation occur at the pole tip B of the field pole due to higher field flux, thus increase in the flux at pole tip B is less than the decrease in the flux at pole tip A.
Armature reaction effects the normal operation of DC Generator in many ways. It actually decreases the main flux by 10% which results the generated emf to fall with the increase in load current. Thus as the load increases the armature reaction losses increases and hence the efficiency of the Generator decreases. This can be easily understand from the load characteristics of DC Generator, which is shown below. Armature reaction also comes in the way of good commutation. In commutation the coil under consideration is short circuited by the brush and the coil should be in such a position, that no current induce in it but it is only possible when the coil moves parallel to the field or the coil coincide neutral zone axis, but overall flux is distorted due to armature reaction and thus it shifts the neutral axis to some other position. This shifting of neutral axis is a continuous process, as the load varies continuously so the neutral axis as well and the brushes never coincide with neutral axis, hence good commutation is unachievable. 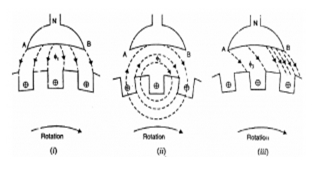 The variation of neutral zone position due to armature reaction is shown in the following figure. However for a constant load current, the rotation of brush hanger mechanism find the correct neutral zone position and then good commutation is possible to achieve. As armature reaction effects are not good for normal operation of DC Machine (both generator and motor). That’s why there are some methods to reduce this effect. First of all the field pole ends are designed in such a way that the higher flux density don’t occur at the pole tips, thus avoiding saturation and hence armature reaction. Besides this the distortion of main field can be prevented by cancelling the effects of the flux produced by the armature current. This can be achieved by installing commutating poles in between two consecutive main poles. The commutating poles are connected in series with the armature winding, but in such a design that they cancel the effect of armature conductor flux and hence we have left only the main field flux. For large machines, the commutation poles don’t completely neutralize the armature current flux because these high speed machines accept changes in their operation in matter of seconds. Thus in this case compensation windings are installed in slots of the poles faces of main field poles. 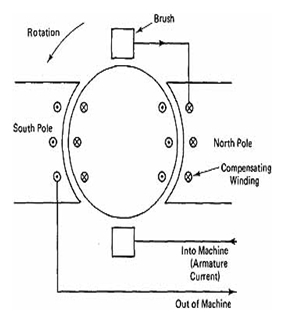 These windings are connected in series with the armature winding in such a position that the current flowing in the compensation winding is exactly opposite to the current flowing in the armature winding at the same time. Thus the compensating winding produces flux, which is completely opposite and equal in magnitude to the armature flux, hence both cancel the effect of each other and thus armature reaction is completely neutralized. Armature reaction is one of the reasons that causes generated emf in DC Generator to decrease. And this effect is as much important to note as the armature losses and other constant loses like windage and iron losses, because all of them consequently gives us a decreased emf. But compensating winding and commutating poles appreciably decrease this effect and greater part of overall losses in DC Generator is compensated. 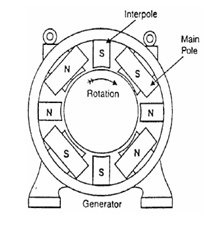 This topic is focused on one particular aspect of DC Generator. Would you like to know more about DC Generator? You have added an informative thread here, i have never seen such kind of information on the web, it’s really a great information for curious person. Thanks for sharing this topic in which you have focused on one particular aspect of DC Generator. Hmm, so what would you add then? Feel free to share your knowledge. SIR, WHAT IS ACTUAL ADVANTAGE OF ARMATURE REACTION IN DC MOTOR.